Daiwa’s J-Braid goes to another level with the release of the premium braid in the line-up, the new J-Braid Grand. A premium 8-strand PE, J-Braid Grand is made from an advanced new raw material (IZANAS) and is J-Braid’s strongest, most abrasion-resistant line ever. Four times more abrasion resistant than other lines, J-Braid Grand has a short pitch fibre construction that significantly reduces line damage and failure to dramatically increase line abrasion resistance and line strength consistency. Like all true premium Japanese 8-strand PE lines, J-Braid Grand maintains a true round profile for optimum line performance through the guides and on and off the reel. 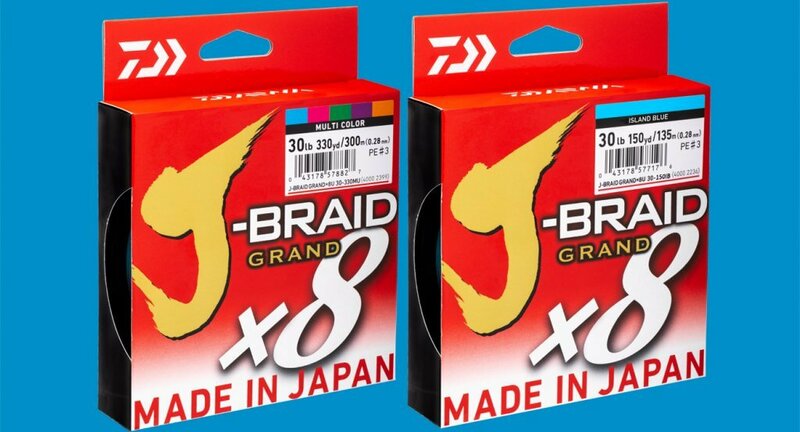 Made in Japan and available in sizes ranging from 6lb (0.6PE) to 150lb (PE16) and in multi and island blue colours, J-Braid Grand is the smoothest and best performing J-Braid they have ever made.